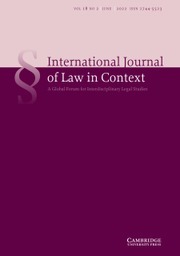 The International Journal of Law in Context provides a forum for interdisciplinary legal studies and offers intellectual space for ground-breaking critical research. It is not committed to any particular theory, ideology or methodology and invites papers from a variety of standpoints, ideologies, perspectives, and methods. It publishes contextual work about law and its relationship with other disciplines including but not limited to science, literature, humanities, philosophy, sociology, psychology, ethics, history and geography. The journal aims to explore and expand the boundaries of law and legal studies.